Just found your blog through Shades Of Gray. I had to comment on this. My husband and I are batty about our dogs. Don't believe me? Read what we did at 2:30 in the morning for our dog yesterday. Some might call us crazy. We'll own it. Following your blog now. Fun read! 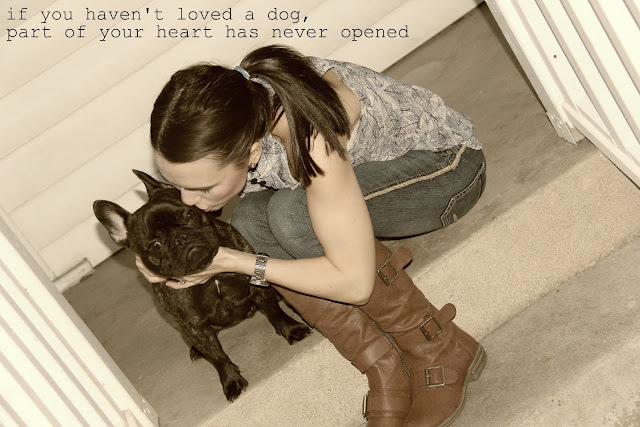 So True, I never thought I could ever love a Dog the way I love our little boy! I cant imagine our little "family" being complete with out him! tis true. what a cutie you have!!! Do you think he's going "mom gawd, not in front of the neighbors!" I heart Ernie. so so true ruthie!! you definitely have to keep a log of all the crazy people you meet on walks with ernie, you post them on facebook and you always get a laugh out of me! totally agree with this, I NEED a dog!!! SO TRUE! I love my Bailey Moo more than anything. Oh Ernie, you little heartbreaker, you. Such a cutie. Awwww LOVE me some little Ernie!!!! So sweet! Love that little Ernie!! AAAA to the MEEEEN!!!!!! You know I agree with you 100% on this!!! I didn't know you did a puppy post too!!!!!! We are such good puppy mommies!